The first rule on Proxibid is never bid on a coin photographed at a slant, which exaggerates luster that in turn conceals condition. Below is a prime example (click to expand photo). The lot description states that this is an MS66 1881-S, worth almost $400. Worse, the auctioneer states “stunning luster almost flawless.” Yes, it has luster. That’s why it can conceal flaws when photographed at the slant. 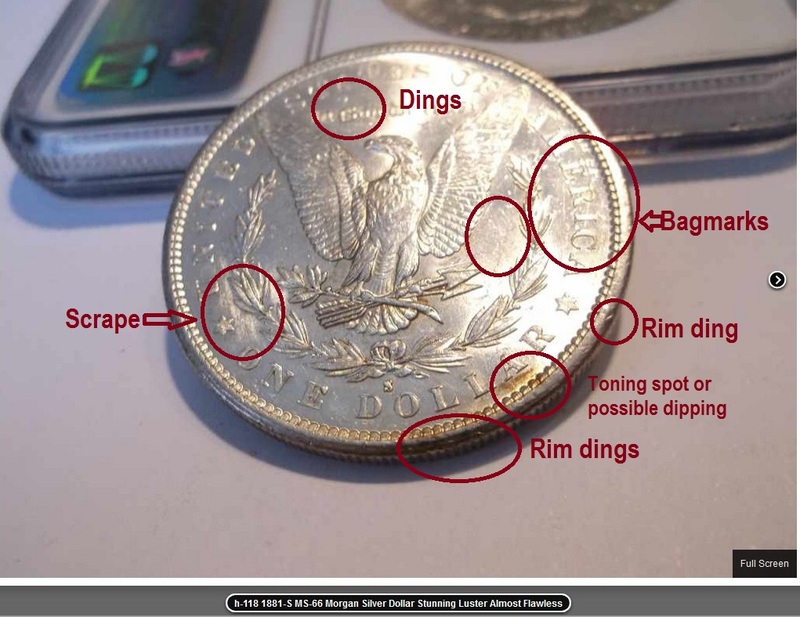 Nevertheless, to a skilled eye, even this old numismatic trick can be deciphered. Expand the lot photo to the max and notice the slightest evidence of common flaws like dings, bagmarks and hairlines. We believe this to be a common MS63 Morgan worth less than $50. Expand photo below to see the flaws we detected. To become familiar with types of flaws, be sure to play our regular “Find the Flaw” game on Proxiblog. Once again, folks, never bid on coins photographed at a slant. Or if you must, stop bidding as soon as you spot the tiniest flaw. Chances are many more are concealed by the reflection of luster. To train your eye to spot flaws, always begin at the rim and rove over the coin in a clockwise manner, gradually working your way to the middle of the coin. Or you can start at the middle and work your way counterclockwise to the rim. Note any anomaly as you inspect the lot. 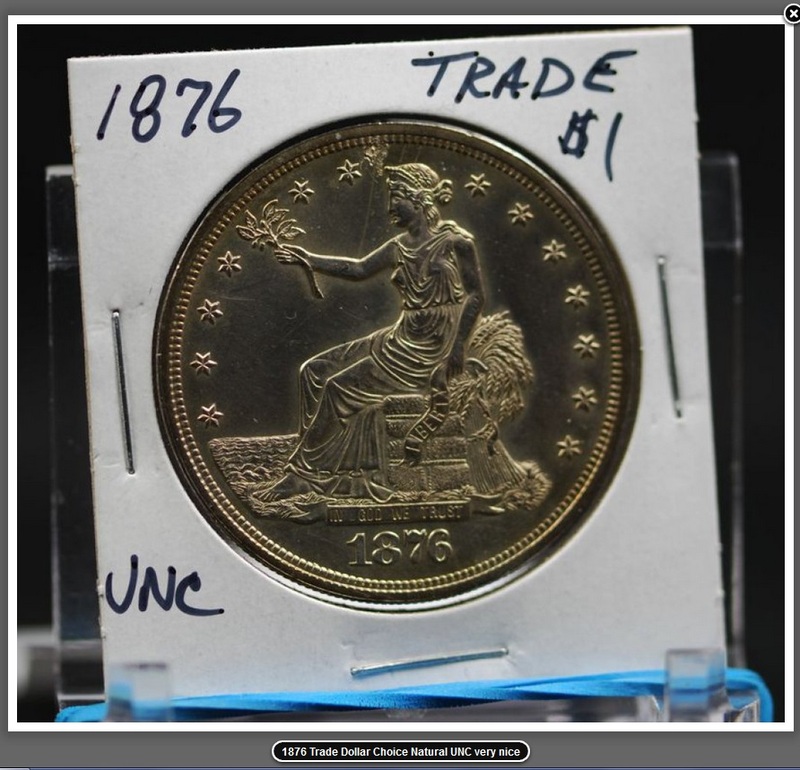 Case in point: The auctioneer states the lot below is a “very nice” uncirculated trade dollar. It is not very nice. If you only look at the description and the middle of the coin, the lot may appear so. This is, in actuality, an ungradeable coin because of significant damage. Did you spot that damage? If not, you had better bone up on grading. If so, kudos on your numismatic eye! 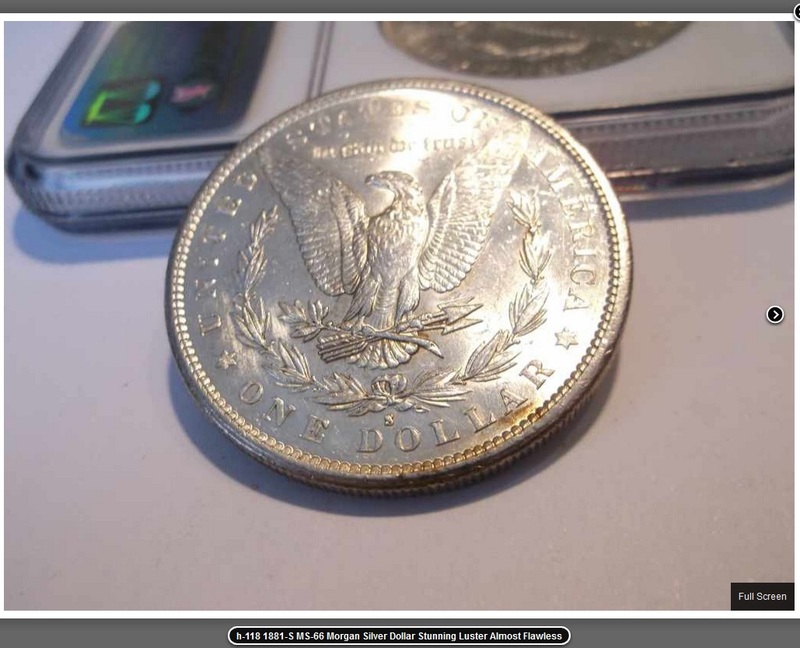 This entry was posted in Uncategorized and tagged American Numismatic Association, Auctioneers, AuctionZip, Best Practices, Coin Auction, iCollector, National Auctioneer Association, PCGS Photograde Online, Proxibid, Proxiblog. Bookmark the permalink.